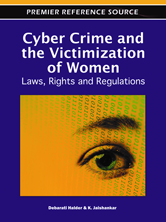 Editor/Author Halder, Debarati and Jaishankar, K.
Cyber Crime and the Victimization of Women: Laws, Rights and Regulations is a unique and important contribution to the literature on cyber crime. It explores gendered dimensions of cyber crimes like adult bullying, cyber stalking, hacking, defamation, morphed pornographic images, and electronic blackmailing. These and other tactics designed to inflict intimidation, control, and other harms are frequently committed by perpetrators who, for many reasons, are unlikely to be identified or punished. Scholars, researchers, law makers, and ordinary women and their supporters will gain a better understanding of cyber victimization and discover how to improve responses to cyber crimes against women.